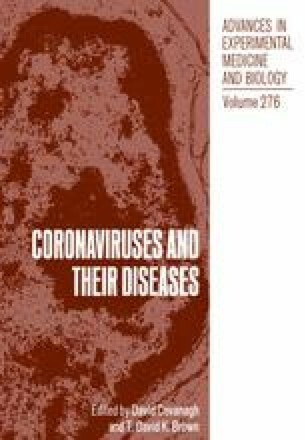 Human coronaviruses (HCV) cause various respiratory, gastrointestinal and possibly neurological disorders. Very little is known of the molecular biology of these ubiquitous pathogens. We have undertaken the molecular characterization of the prototype 229E strain of HCV. The virus grew to the highest titers on a human embryonic lung cell line (L132) at 33°C and purification was optimal on Renografin-60® gradients. Metabolic labeling with [35S]methionine or [3H] glucosamine or galactose and analysis by SDS-PAGE revealed at least five structural proteins, which could be identified by analogy with murine coronaviruses as follows: the spike glycoprotein (E2/S), in both monomelic (88–97 kDa) and dimeric (190–200) forms, the nucleoprotein (N) at 52–53 kDa and the matrix protein (El/M), in both glycosylated (25–26 kDa) and non-glycosylated (20–22 kDa) forms. Monomeric, dimeric and multimeric (>200 kDa) forms of E2/S incorporated glucosamine and galactose, whereas only galactose was incorporated into El/M. Mult mers of El/M, with apparent molecular masses of 44, 74 and 140 kDa, were formed in the absence of a reducing agent.